We spend a lot of time watching what is going on in the world. One of the advantages of having a customer-based intelligence sharing program as well as a distribution of our own sensors in the wild is that we are able to watch as threats change. When new threats come into play, or when existing threats change, rules have to be created or modified. Over the next few weeks, we're going to share some of the rules we've written in response to these threats and go over why we chose to write them in the way we did. Hopefully this will help you in your custom rule-writing. So, this rule has a couple of things worth mentioning. First, the rule is written with $FILE_DATA_PORTS. This means that we look at it over HTTP, POP and IMAP. So a PDF matching this over any of those vectors will trigger the rule. Next we have flowbits:isset,file.pdf;. This rule option checks to make sure that Snort has seen enough to know that this is a PDF file. That way, this web page won't trigger the rule. Another thing to notice is that the content match for "NEW PDF EXPLOIT" is followed by fast_pattern:only;. Normally, Snort uses the first, longest content match as the content for the fast pattern matcher. This content becomes the triggering condition to enter full rule evaluation. The fast_pattern; option overrides that, telling Snort to use the associated content match in the pattern matcher, not the first, longest content. This rule has only one content match, so that functionality isn't important here. Instead, I used the functionality of the "only" modifier to fast_pattern to eek out a little speed increase in rule performance. Using fast_pattern:only; instructs Snort not to look for the content during rule evaluation, as that content has already been seen during fast pattern matching. It is important to know that because the fast pattern matcher is case agnostic, any match that is marked as fast_pattern:only; acts as if it had the nocase; modifier. Also, this modifier can only be used when the content match is not associated with a relative match, because when Snort doesn't look for the content during rule evaluation it doesn't know where the content is in the packet, so relative content matches won't work. Using the fast_pattern:only; construct means that when the rule enters evaluation, the only checks are for flow direction (making sure the packet is moving from a server to a client) and ensuring that the flowbit for pdf files has been set. This makes for very fast rule evaluation. The wild, wild west of the Internet is moving very quickly right now. 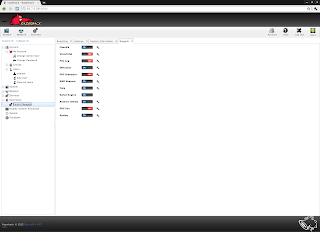 In particular, exploit kits morph almost day-to-day. Having a firm understanding of how the various rule keywords work together is important to build the detection you need. Hopefully this blog post gave you a little insight into the rule-writing process. We'll be putting together more posts going forward that give slightly more complicated examples. Stay tuned! 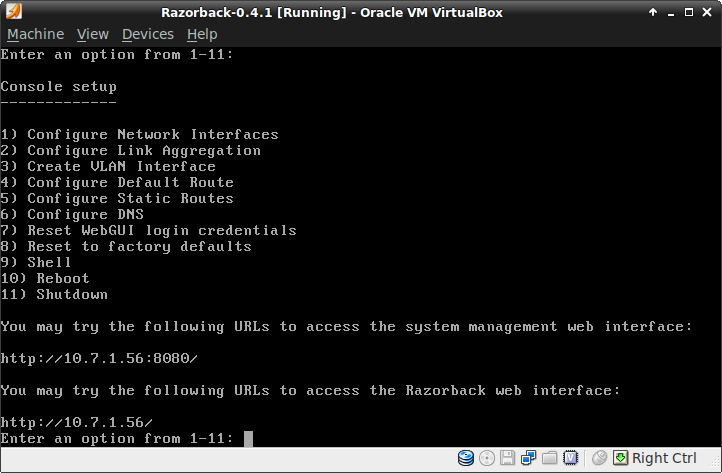 With the recent release of Razorback 0.4.1 we decided to update the Virtual Appliance image to this release. The target audience for the appliance is people that want to test drive the system without going though the process of installing the system and its dependencies. 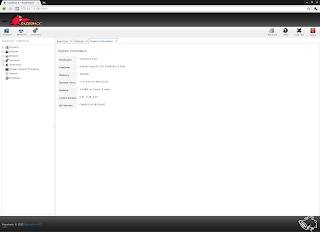 The virtual appliance is based on FreeBSD 9.0 (i386) and requires 4GB of RAM on your host and 20-30GB of hard disk space. 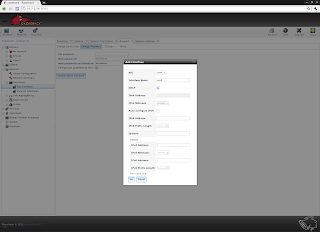 We build the VM in VMWare ESXi, but it should run on any hypervisor that can import an Open Virtualization Format archive (OVA) virtual machine; in this guide I will be using VirtualBox. Virus Total Nugget (disabled by default, requires API key). Select the OVA file that you have downloaded and follow the prompts to deploy the machine; if you are asked if you would like to reset the VM's network cards' MAC addresses at any point you should select yes (or tick the box in the case of VirtualBox). If you see a bunch of output related to masterNugget or dispatcher then you may just hit return and the menu should present its self. Enter your new password and confirmation leaving old password blank. Make sure that "Change root password as well" is selected and click the "Change Admin Password" button. Now the Alert button in the top right should be solid green rather than flashing red. 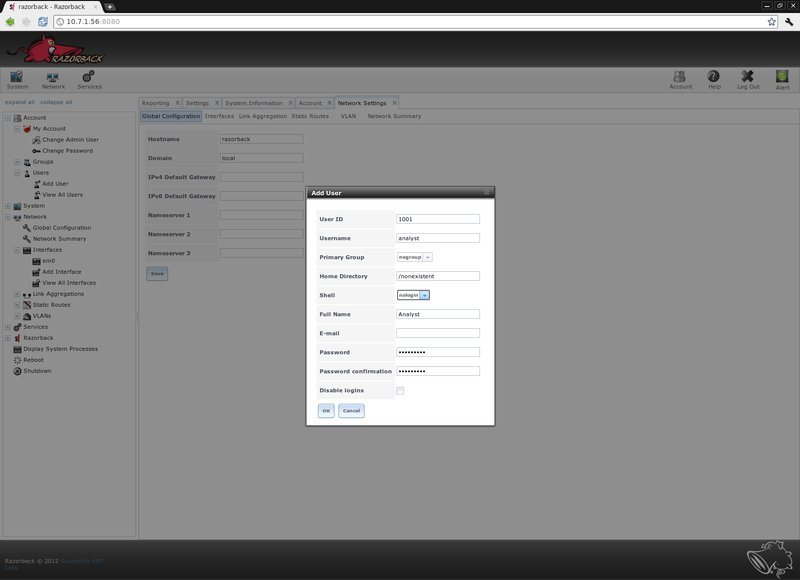 Configure the interface to fit your environment (I'm using DHCP in the example) and click ok. If you are moving to a static IP configuration you will need to go the the "Global Configuration" item under network and set your default gateway and name servers. Now you should reboot the appliance to make sure that the network configuration changes took. 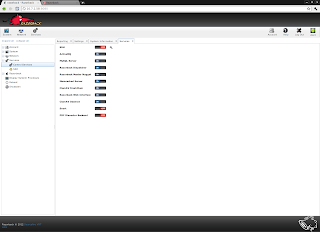 Select "Reboot" from the menu. 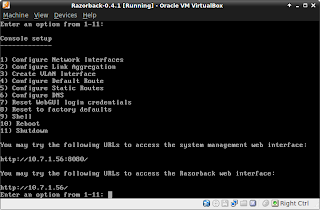 Once the machine has rebooted you should be able to log into the razorback web interface by browsing to the URL listed on the boot menu (in this case, http://10.7.1.56/). 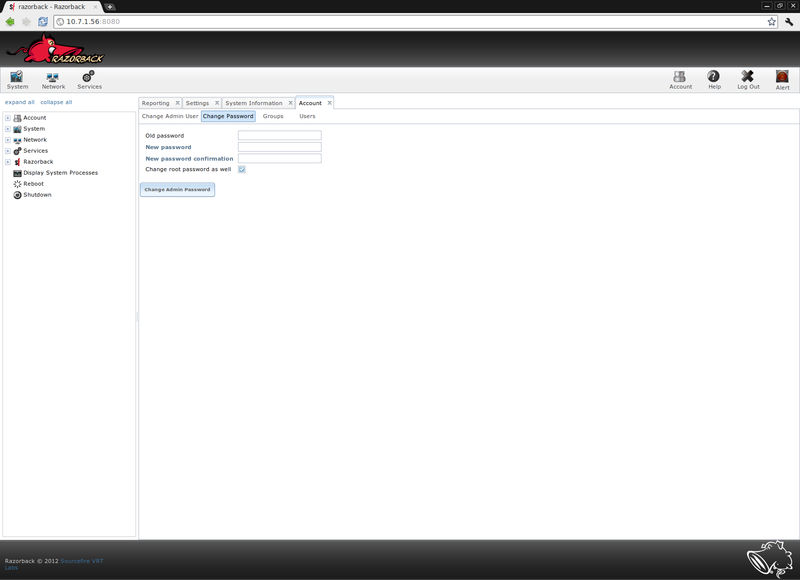 Log into the system web interface with the admin user (whose password we set earlier). Expand the Razorback element in the tree and select "Control Nuggets". 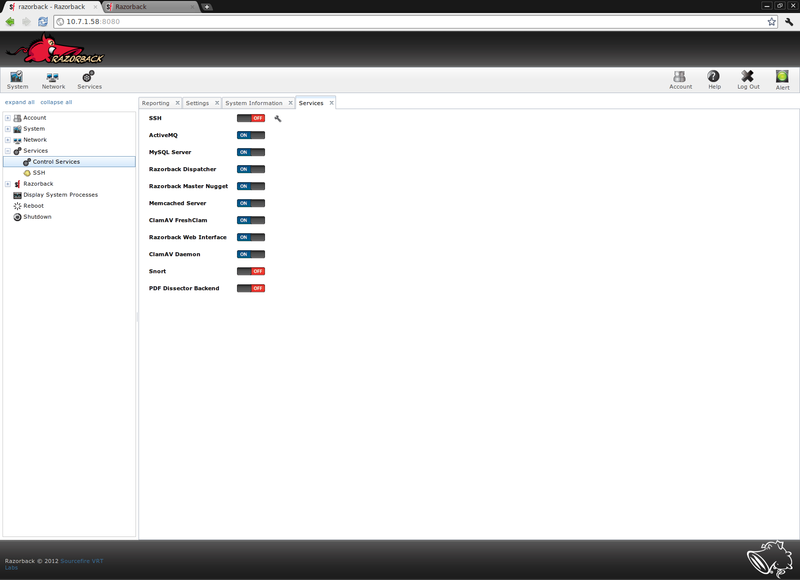 To change the configuration items for a nugget click the spanner icon next to the on/off switch. To turn a nugget on or off just click on the on/off button, your changes should be reflected on the razorback interface under nugget status. To do this we need to add a capture interface to the appliance, making sure that you enable promiscuous mode for the interface. VMWare ESXi - Change the configuration of the vSwitch and the port to allow promiscuous mode for the interface. 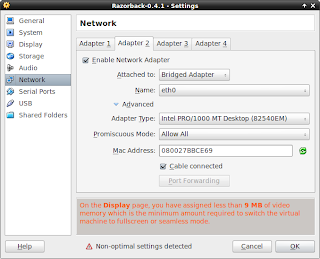 VirtualBox - Select "Allow All" under Advanced->Promiscuous Mode as shown above. 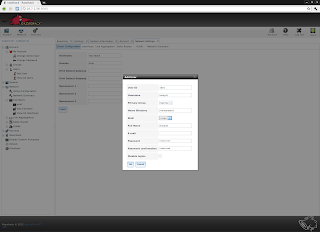 Add a third interface to the appliance connected to your second virtual network. 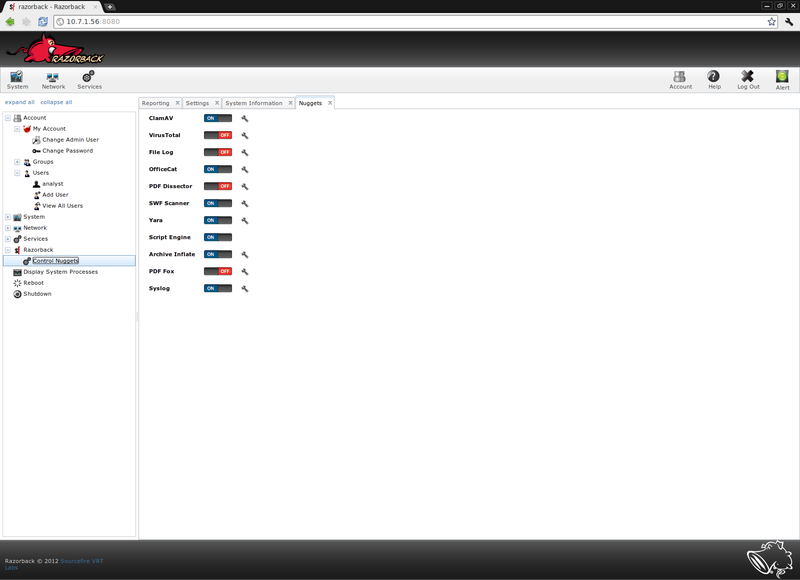 Select shell from the system console. Comment out the lines starting ifconfig_em1 and snort_interface under the heading "TAP/Span interface on em1". Un-comment the lines under "Inline configuration em1+em2". Lots of people in the security space are familiar with the blog of Brain Krebs, a former Washington Post network security writer and one of a tiny number of IT security journalists who actually gets it. If you're not following him on Twitter (@briankrebs), you should be. "Don't look now (seriously, don't unless you're ninja) but Twilight author Stephanie Meyer's site appears 2b serving up Crimepack Exploit kit"
I was just lucky enough to notice this tweet within moments of it being sent out. As someone who hates sparkly vampires, I immediately went out and did a wget of the site in question, and pulled down an awesome PCAP. Besides having bad 90s-era HTML, the site was indeed infected with a bad case of the Crimepack Exploit Kit, as Mr. Krebs had noted. In the meantime, pay attention as you're browsing the Internet - you never know what sort of evil awaits you, even in the lamest of its corners. This is the first in a series of blog posts about the Content IQ Test. The rules of the test are simple: "The objective is to create a single content rule that fires on all of the Test Files but not on any of the Negative Control files. [...]Triggering on the test files' [...] filenames or MD5 hashes and stuff like that is cheating and it doesn't count. " Let's see how ClamAV does at this. These files are all benign, so I encourage you to download and check out how these files are crafted. OK, we are detecting the control file and are not detecting the negative control file. Let's proceed! Test file 2 contains the control text pasted into the body of a Microsoft Word 2011 document. Test file 3 contains the control text pasted into the body of a Microsoft Excel 2011 document. Test file 4 contains the control text pasted into the body of a Microsoft PowerPoint 2011 document. Therefore, I modified the signature alerts if we see "eval" followed by "unescape" no farther than 200 bytes away, in turn followed by "('%65%76%69%6c%28%29'))" no farther than 200 away from "unescape". Test file 5 contains the control text pasted into the body of a PDF document. Test file 7 contains the control file compressed with Zip. We see that a ZIP archive is treated as a container. Its contents are inflated and examined. Test file 8 contains the control text pasted into the body of a Microsoft Word 2011 document. This Word document is compressed with Zip, then Tar, then RAR. As with Test file 7, archive files are treated as the containers they are. Here, ClamAV recursively extracts the contents of the RAR, TAR and ZIP files. Finally, Test file 9 contains the target string embedded in the metadata of an Excel 2011 file as a custom property. Today we saw how ClamAV fared with the basic content test files. In the next post I'll take a look at the test files with auto-executing embedded active content. A Document was sent to you using a XEROX CORPORACE FSX43949461. The resulting ownage was classic. After briefly displaying a circa-1995-looking "Loading...Please Wait..." atop the page for a moment, the browser window went away, and the virtual machine's hard drive suddenly started cranking very heavily. Looking at the packet capture, the system immediately contacted a host in Russia, and started communicating over HTTP on port 8801; several files came down, including one named "yrkrktxzfniq.exe". A quick look at that file on VirusTotal showed that it was - surprise, surprise - malicious, and goes by the name of Worm.Cridex. The exploit kit was easy enough to detect - SID 21108 does the job - given how blatant the obfuscation was. While we're busy working on more complex kits, such as Blackhole (see SIDs 21041 - 21045, 21141, and 21259), it's nice to be able to pick off less sneaky ones like this. Up until this past year, I had never included any marketing materials in my slides. It never seemed to fit in with a technical presentation, even though I always believed in the Sourcefire product line's ability to defend our customers in the face of a rapidly changing landscape. Having open source solutions, backed by the VRT's ability to convert real-world intelligence into new detection, while still giving the customer the option to build their own custom detection is a powerful combination. But now our company has come up with a corporate vision and marketing message that speaks directly to how successful organizations approach security and I am really impressed. We call it "Agile Security" and it basically describes a security cycle that is critical to keeping network defense up-to-date in a changing threat environment. It recognizes that static defenses simply can't stand up to the realities of today's security environment and that the ability to monitor dynamic networks is just the first step in a successful security stance. It also is an excellent description of how the VRT approaches converting its streams of intelligence into protection for our customers. The concepts of Agile Security are broken up into four essential elements. The first is "See", meaning that you can't protect yourself if you don't have a current understanding of what is is you're trying to defend. With the encroachment into the network by consumer electronics in the form of smart phones, tablets and laptops along with the rapid turn over of technology in today's corporate environment this can be difficult. Organizations can use active or passive techniques for tracking changes in network topology as well as new devices as they come online, but whatever the approach it is critical to know what you're defending right now. The second element of Agile Security is "Learn", which focuses on gathering information about vulnerabilities, exploits and malware that threaten your environment. This is where you leverage your understanding of your network to map known threats to vulnerable targets within your network. For example, Android malware is an evolving threat. Do your users use their smart phone and integrate into your network making this malware a threat to your network? This is also where you cycle information you gain by incident response teams into your cycle for evaluation by your security development teams. Have you found a new malware on your network? How did it get there? What is it trying to do? Where did your defenses fail? This information leads to the next phase of Agile Security, "Adapt". "Adapt" is the phase where you convert your intelligence into an actionable defense. In some cases this is automatic, such as when the VRT releases a new rule or when the FireAMP system seamlessly adds detection to their cloud-based malware solution. Other times the situation is unique to your enterprise and detection can be added with custom Snort rules or ClamAV signatures. Sometimes the answer isn't in anti-virus or IDS systems. Perhaps the answer is a traditional firewall rule, application control or even a change to existing policies and procedures. Whatever the question this is the phase where you develop the correct answer for your environment. The final phase is "Act", where the solutions developed in the "Adapt" phase are incorporated into your security stance. Often this happens automatically as your Snort and Sourcefire 3D sensors are updated with new detection content or when ClamAV and FireAMP receive new signature updates. Updates may also be custom signatures and rules created by your own organization. Sometimes changes to your security stance must occur within the policies of your environment. For example you may be subject to change controls before making firewall changes or QA checks prior to deploying custom detection. However it happens, now is when you bring your new defenses online. 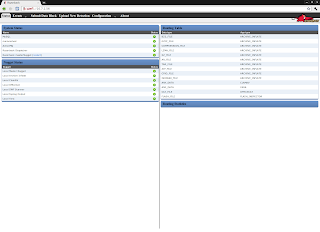 From here you monitor how your network and your adversaries react to your changes, and the cycle starts again at "See". I know, that's two nice posts in a row. No doubt I'll be angry about something next time. The Razorback team has released version 0.4.1 (yeah, we would have released 0.4, but we found some critical bugs that we really needed to fix before general release). 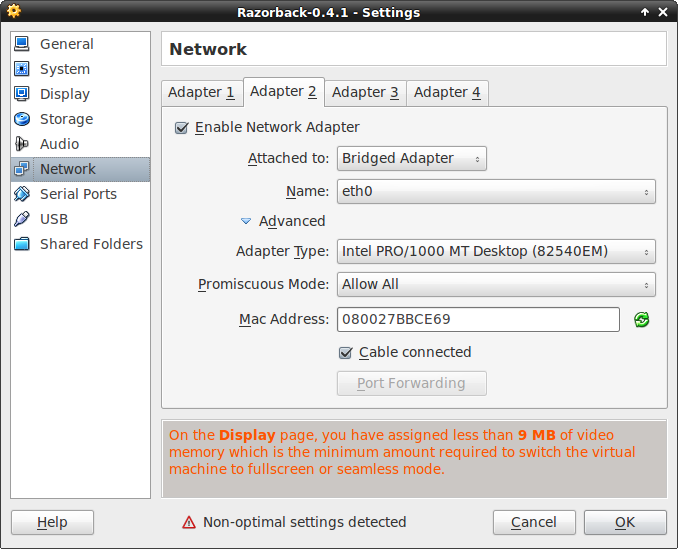 You can find the new version of Razorback here: http://sfi.re/zQQOQ4. We've done a lot of work both on the internals of Razorback as well as a couple of new nuggets. The first change I'd like to discuss is the concept of locality. Because of the large network traffic that could be generated by the system, we wanted to be able to take advantage of a shared file system to increase throughput and, depending on what kind of shared system you are using, reduce the amount of network traffic. To do this we've developed the concept of locality. If you share a locality with the dispatcher, you will access the data blocks directly from the shared disk system. By default, the dispatcher locality is 1. Any other locality will result in datablocks being transfered over the network in the standard way. So if you have a fast shared disk system, be it NFS or a SAN setup, set the locality in api.conf and this should increase your throughput. Speaking of data transfer over the wire, we've added encrypted data transfer. Not surprisingly, this is fairly CPU intensive in certain cases, but depending on your needs this may be a required piece of functionality. The transfer goes over SSH/SFTP and uses the standard libssh library. We've removed transfering the datablock by putting it in the queue (this resulted in too much data in the queue) so currently this is the supported network data transfer. The username is automatically the nugget id, and this is checked against the database setup and the password is configured in the api.conf. 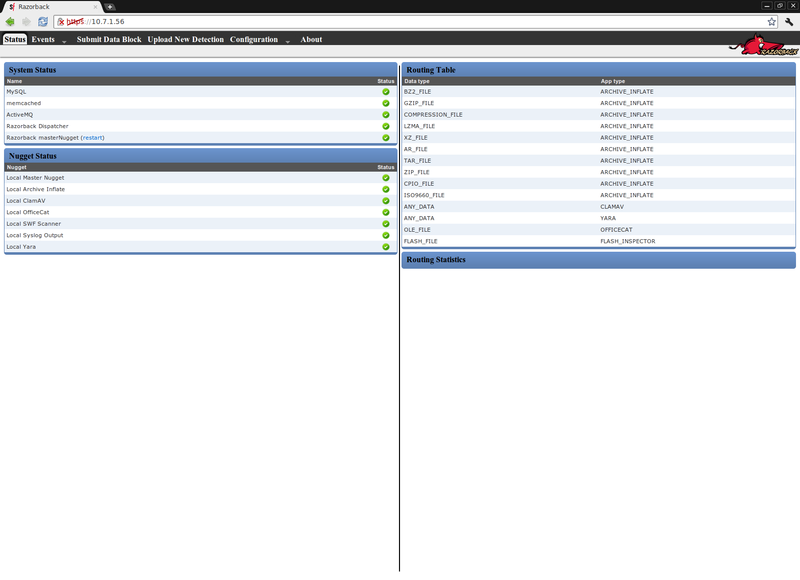 Another place we use the locality concept is in our new master/slave high-availability setup for the dispatcher. Dispatchers in a master/slave setup must share a locality so as they fail over they have all the datablocks that have been transfered to the dispatcher. In the master/slave setup the routing table is shared between the servers so in the case of failover none of the nuggets will need to be re-registered. Because of the queue server setup, all of the pending requests will then be handled by the new master nugget on failover. CLI commands for viewing the status of the high-availbility setup and force-failing servers have also been added. We've added three new nuggets. Two of them, syslogNugget and razorTwit, demonstrate the new output nugget capability. As alerts and status changes come into the dispatcher, details are placed into a queue that output nuggets can subscribe to. This capability is intended to reduce the impact of database queries and to provide an alternate, installation-specific, capability for logging. See the nugget samples for more information, they are fairly straightforward. 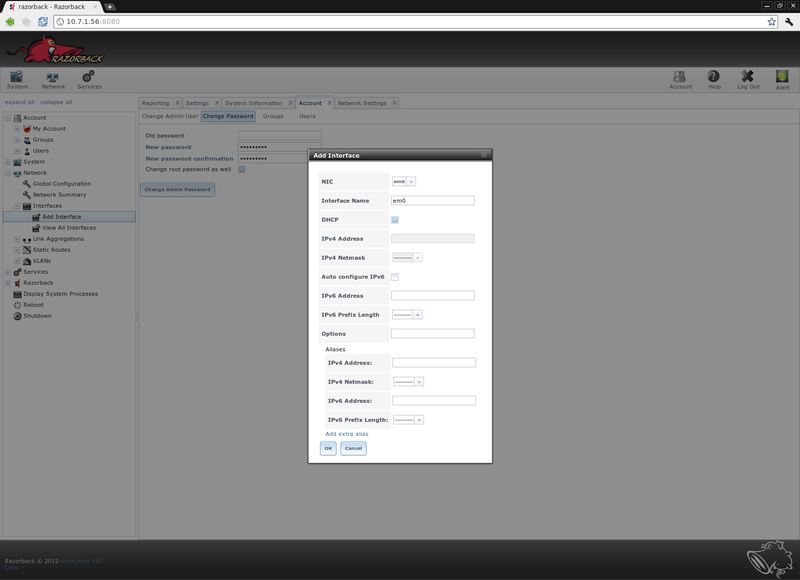 Finally, we are introducing a beta build of the new PDFFox nugget built by Ryan Pentney. The idea behind this nugget is to provide an open-source pdf analyzer that doesn't rely and a costly commercial application to work. The project is still coming together, and you should probably run the latest from trunk, but its coming along nicely and provides solid detection. So that is it, besides a bunch of bug fixes from 0.3. We're now working on the Q1 2012 development cycle and it entirely revolves around the Windows API and several nuggets to plug into anti-virus systems. We're also deploying our first major in-house production build of Razorback, so numerous performance tweeks are in the works. Expect information about how to tweak each of the components for maximum performance as we complete the Q1 run. For those that use our VM, the updated 0.4.1 VM should be up shortly; Tom Judge is making a few tweaks on that side before we release it. We want to say thanks for giving Razorback a try, let us know if you have any issues via the mailing list or #razorback on freenode.